(5) Allow to set for a half hour and cut into squares. Note: I use raw honey for better nutrition. You can also substitute sorghum for the molasses by changing the recipe to half a cup of sorghum syrup and half a cup of honey. I also double the recipe to get thicker pieces. This fudge freezes very well, so you can use half and freeze half. I have also used powdered goats milk instead of cow's milk, since it is easier to digest. It is also more expensive, but just in case you are sensitive to cow's milk, you may tolerate this recipe made with goat's milk. Interesting Fact: The recipe for peanut butter fudge shown above has several examples of complementary proteins. The milk and peanut butter the seeds and milk, and the seeds and peanut butter. If you use soy milk (legume), it is complementary with the sesame seeds to form a complete protein. While most fudge is made with chocolate and is loaded with sugar and saturated fat, this fudge is actually quite nutritious. It still has sugar in the form of honey and molasses, but it is less sweet and is low in saturated fat. In addition, both honey and molasses have other nutrients, that are not found in the processed white sugar that is used to make most kinds of fudge. Be sure to use old-fashioned peanut butter, to avoid the trans-fats found in the hydrogenated versions. Sesame seeds are good for you. Sesame seeds are tiny, oval-shaped seeds that are commonly used for their oil and as a addition to the top of rolls and buns. They are rich in copper and manganese and a good source of lignans, fiber that helps lower cholesterol. Sesame seeds are also used in Halva (sweetened) and Tahini (butter). The use of these tiny, nutritious seeds dates back to ancient times. In addition to the recipe listed above, you can sprinkle sesame seeds on your homemade breads for extra texture, nutrition and eye-appeal. Interesting Fact: The light-colored sesame seeds that you see on commercial products, such as rolls and buns, may have had their hulls removed. Sesame seeds that have not been hulled can be white, brown, red or black. 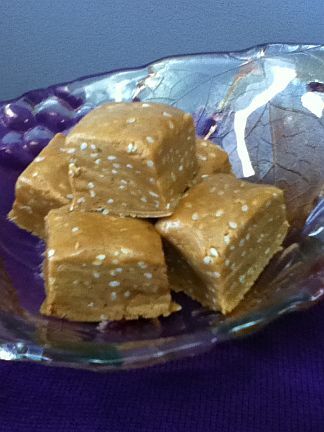 Click here to go from Recipe Peanut Butter Fudge page to Protein page.